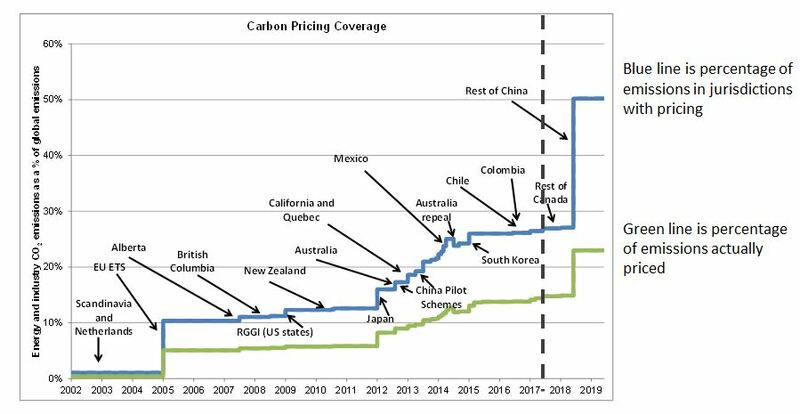 The spread of carbon pricing around the world since 2005 has been remarkable. In the early 2000s carbon pricing was in place in just a few jurisdictions, mainly in northern Europe, accounting for less that 1 % of world emissions. The first major increase in the coverage of carbon pricing was the introduction of the EUETS in 2005. Since then many other jurisdictions have introduced pricing. Around a quarter of CO2 emissions from energy and industry are now in jurisdictions with pricing. A national emissions trading scheme in China is expected to be introduced before the end of this year and consolidating over the remainder of this decade. These measures will mean that jurisdictions accounting for around half of emissions of CO2 from energy and industry will have some sort of carbon pricing in place, with just under a quarter of global emissions of CO2 from energy and industry priced. All this will have been achieved in only about a decade and a half. This is illustrated in the chart below, which shows over time the proportion of CO2 emissions from energy and industry that are in jurisdictions with carbon pricing (blue line), and the proportion of that are priced (green line) . Notes: The blue line on the graph shows the percentages of emissions in jurisdictions with carbon pricing, and includes the total energy and industry CO2 emissions for each jurisdiction with carbon pricing. Thus, if all jurisdictions in the world had carbon pricing in place the total coverage would be shown as 100%. The green line shows the amount of emissions actually priced. This represents a smaller fraction of world emissions than the blue line, as not all emissions in jurisdictions are priced – typically carbon pricing only covers about half of total energy and industry CO2 emissions, although it is more in some cases (e.g.California) and less in others (e.g. RGGI). For clarity the proportions are fixed at 2013 levels, although they change over time in practice. Note: Data excludes the Australian Safeguard Mechanism, the Washington State baseline scheme, and the proposed South Africa tax (which has been repeatedly delayed). With measures in place across the EU, China, and parts of north and south America carbon pricing has become the norm. This is likely to put pressure on other jurisdictions without such measures to act. Looking at broader climate legislation, including not just carbon pricing but also other measures aimed at emissions reduction or adaptation to climate change, a similar pattern of rapid growth is evident. Legislation around climate change is now in place in 164 countries including the world’s 50 largest emitters. A total of more than 1200 climate change and related laws now in place compared with 60 in 1997. This includes legislation in many low income countries. There are, of course, many reasons to remain cautious about progress. The national scheme in China remains uncertain in its coverage, stringency and effectiveness over time. There have been setbacks at the Federal level in the USA. Prices in the EUETS remain low. And, even with all the present and prospective schemes in place, emissions reductions still fall short of what’s necessary to achieve the goals of the Paris Agreement. But there has been tremendous progress in a relatively short time. Discussions on climate policy needs to recognise this context. There remains a pressing need to enhance this world-wide momentum, so that global emissions can begin their ever more necessary rapid downward track. But acknowledging that should not obscure the remarkable progress that has been made. Data: Emissions data is for 2012, from the EDGAR database, with no adjustment for changes in relative volumes over time. Shares at subnational level are estimated based on a range of data. Data sources include http://edgar.jrc.ec.europa.eu/ and Zhao et. al., China’s CO2 emissions estimated from the bottom up: Recent trends, spatial distributions, and quantification of uncertainties Atmospheric Environment, Volume 59. Any chance you can update this chart to reflect the Chinese government decision to pull forward their National ETS to 2016? While the details are still to be confirmed, this will have a huge impact on the global emissions covered by new commitments. A good point. I recently posted on this issue, see https://onclimatechangepolicydotorg.wordpress.com/2014/09/30/carbon-regulation-becomes-the-norm/ I have the China national scheme starting in 2018 to allow for some delay – which seems quite likely with such a complex undertaking, especially in view of the delays to the trial schemes. I’ve also included US EPA regulation which is likely to include some pricing (explicit or implicit), which takes you to about 67% coverage. I have now updated this page to reflect these.